A useful and interesting tool, but limited by its lack of lower-level control and tweaking potential. USB host and device support. Flexible CV/Gate input system. Deals with a range of interconnection/ interfacing scenarios. No sync input. Expensive. Unlabelled top panel. No software editor. Teenage Engineering's OP-1 is for many the epitome of 21st century Scandinavian cool - and that's before it even makes a noise. Alongside a wealth of OP-related accessories, TE's design expertise extends into lighting, trainers, loudspeakers - and the Oplab. Although the name indicates an extension to the OP-1 universe, Oplab is self-contained. 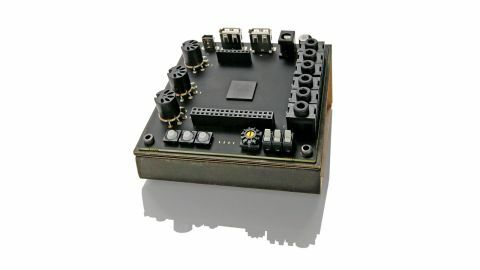 TE calls it a "musical experiment board" - and its website suggests all manner of interfacing possibilities - with both USB and MIDI easily discernible from their familiar socket footprints. Oplab in physical terms is little more than a black-faced circuit board with all connectors and controls soldered to the front panel. Out of the box it comes bolted to a cardboard stand, though it can be detached to sit horizontally on rubber feet, or mounted in an optional (49 euros) aluminium case. "Use a stereo jack and you can extract a +5V supply from the connector's Ring"
Power is provided by the included 5V PSU and, on plugging it in (there is no on/off switch), a few of the small surface- mounted white LEDs spring to life. In terms of I/O, Oplab takes in CV/ Gate and DIN Sync 24 besides the aforementioned USB and MIDI. USB comes in the form of a host port (for connecting to a computer and allowing the unit to act as MIDI interface) as well as two device ports, to allow direct (and computerless) integration with keyboard, pads, encoders and other forms of 'Class Compliant' USB kit. Two CV outputs allow for interfacing with the analogue world, with CV1 calibrated for MIDI to pitch conversion (and switchable between V/Octave and Hz/V scales). CV2 takes Mod Wheel data as its source. The Gate output can also be used as an S-Trig output, with both taking their cue from incoming note on/off data. The CV inputs follow a broadly similar pattern, but use stereo 3.5mm jacks to expand their usefulness. With a mono jack inserted they respond as you would expect, but use a stereo jack and you can extract a +5V supply from the connector's Ring. So with little cable DIY you can plug in any variable resistance-based sensor - neat. Equally a stereo jack inserted in the Gate input can be triggered by shorting the Tip and Ring. Incidentally, the CV1 input is V/ Octave only (precluding its use with the Korg MS-20 for example). The DIN Sync 24 output is a trigger pulse tempo sync system used by Roland on a lot of their earlier X0X and sequencer gear. Sadly no sync input here though. A rotary mode switch and three rubber buttons select between Oplab's different conversion personalities. At the moment only six of the available ten are implemented. The first four modes select between single source, single destination, everything merged and a two-way CV/MIDI convertor. Clock Master mode speaks for itself and offers Stop, Start and tap tempo features. Sensor mode turns CV inputs into pitch-bend and mod wheel data. What about the 34-pin header utilised as a multi-channel trigger to MIDI converter in the 2012 promo vids on TE's website? Well, the manual (May 2013) merely says 'specs TBC'. Shame. Oplab is certainly useful, interesting and potentially fun, but it is not cheap, especially given it is uncased, has an unlabelled top 'panel' and appears to have been somewhat forgotten in terms of updates. We successfully plugged and played with a range of computers, controllers, drum machines and synths using different MIDI, USB and CV/Gate routing scenarios. However the options are limited to what TE decide you need. A computer/tablet-based software editor would open up its potential for more unusual conversion and mapping options, perhaps justifying its price.